Holocaust-deniers claim that there never was a Nazi plan to exterminate the Jews of Europe. They find it very difficult to explain away this speech, given in Poznan (also spelled "Posen") -- in which Heinrich Himmler talks about the "extermination of the Jewish people" and says quite frankly "we're eliminating the Jews, exterminating them." Ich meine die "Judenevakuierung": die Ausrottung des jüdischen Volkes. I am talking about the "Jewish evacuation": the extermination of the Jewish people. ...wir hatten die Pflicht unserem Volk gengenüber das zu tun, dieses Volk, das uns umbringen wollte, umzubringen. ...we had the duty to our people to do it, to kill this people who wanted to kill us. ...wir wollen nicht am Schluss, weil wir den Bazillus ausrotten, an dem Bazillus krank werden und sterben. ...at the end of this, we don't want, because we exterminated the bacillus, to become sick and die from the same bacillus. Holocaust-deniers are no strangers to sweeping evidence under the rug with sophistry, and this speech is no exception. Their argument comes in three main parts. First, they occasionally argue, the speech is a forgery. This is simply not tenable -- the original recordings are in the possession of the United States National Archives in College Park, Maryland. Anyone who wishes can send a letter to the National Archives and Record Association, as this writer did, and obtain a cassette-tape copy. The voice is clearly Himmler's, the notes for the speech cover the whole three hours (this portion included), and there is not a single shred of evidence of any kind to suggest this tape is forged or edited. Even deniers who want to take this route trip over their feet. David Irving, for example, on the witness stand in 1988, was asked whether the speech was accurate. Irving was not one to miss an opportunity for self-aggrandizement, but he confined his misplaced suspicions to some waffling commentary on Himmler's handwritten notes and transcript. He had probably not even heard the audio recording, and could not impugn its integrity. Second, they try to argue that Himmler was simply not to be taken literally -- he was exaggerating, or speaking metaphorically. This is baffling. One wonders if those who try this argument have heard or read the speech. Heinrich Himmler speaks of plain facts: that the Jews are being exterminated like bacteria, corpses are piling up hundreds at a time, the Jewish people have to be killed, this is a great and secret glory for the SS, and so on. It is not persuasive to insist that he is being flowery or figurative. And why would he? He touches on this subject in order to tell the SS men to stay strong, don't talk, and don't steal. If someone exaggerates a point for rhetorical emphasis, they exaggerate the point that they are trying to make, not a different one. Himmler did exaggerate in this passage -- when he described death as the punishment for any SS man who took "one fur, one Mark, one cigarette" from the dead Jews. Would the SS really shoot one of its own soldiers for taking a cigarette? Probably not. This helped make Himmler's point. But overstating the scope or effect of the Holocaust, or outright lying about the state's ultimate intentions for the Jews, would not have. In fact, if the Jews were not actually being exterminated, then for the audience to hear confirmation of the Allies' worst propaganda about the Nazi regime would have been distracting and confusing, to say the least. Himmler would have blunted the point he was trying to make, and left an audience of SS officers wondering what in the world their mandate was regarding the Jews. That would be quite absurd, so this argument makes no sense. Irving claims that it really means "stamping out" or "rooting out." "Mistranslation" is the main argument and it is easy to dismantle. There are other claims besides these (and they all tend to contradict each other, just as these main three do). But these are the primary three. So let's take a close look at our translation, particularly of this word "Ausrottung." The verb "ausrotten" or its noun "Ausrottung," in the context of living things, refers to killing -- and not just killing, but an especially thorough destruction, a way of eradicating something so that it can never come back. It is usually translated "extermination," and while that perhaps misses the character of the utter and irrevocable annihilation of "Ausrottung," it is probably the best English translation. Ich meine die Judenevakuierung, die Ausrottung des jüdischen Volkes. I am talking about the Jewish evacuation, the deportation of the Jewish people. For Himmler to say this in 1943 makes no sense in the broad context of the history of the Holocaust, but of course that history is what Holocaust-deniers deny, so let's ignore that for a moment. Here are a few specific reasons why their translation is untenable. First, it is simply wrong. Don't take our word for it; ask any native German speaker. (Or ask Google.) No native speaker will fall for this, and no German denier has ever dared to suggest it to a German-speaking audience. German Holocaust-deniers, writing in German, of course know what "ausrotten" means. They use the word to describe killing, extermination, annihilation, because that is what it means. Here's an example of how German Holocaust-deniers describe "ausrotten". If you are still reading, you are probably not a native German speaker, so you want more reasons. Healthy skepticism is good! Keep reading. Everyone in the world had known for years that Germany wanted to deport its Jews. If the only thing he was talking about was deportation, why was he emphasizing secrecy to his officers? Listen to Himmler's voice as he explains the meaning of the code word "Judenevakuierung": his voice goes up on the code word, which everyone has heard of and most know is code; he pauses briefly for dramatic effect; and then as he reveals that it really means "extermination," the tone of his voice falls. Here is the euphemism, he is saying, and here is its meaning. If he were simply saying the same thing twice in different words, why would the first version be phrased straightforwardly, and the second with such gravity? ...wir wollen nicht am Schluss, weil wir den Bazillus ausrotten, an dem Bazillus krank werden und sterben. ...at the end of this, we don't want, because we (ausrotten) the bacillus, to become sick and die from the same bacillus. It is impossible to imagine a successful translation of that sentence in which bacteria are deported. This is because "ausrotten," when used in the context of living things, whether bacteria or Jews, means the complete destruction of those things through killing. "Völlige Vernichtung" means "complete annihilation." The only change is the typeface. But the Sprach-Brockhaus is a small dictionary, providing not much context. Let's look at a more complete dictionary, the Muret-Sanders. This one is also German-to-English, so it will be most useful to English speakers (who will be the only ones confused by this word). ausrotten: I. 1. Unkraut [weeds]: to root out or up, to outroot, to uproot ... Volksstämme [races], Wölfe [wolves]: to exterminate. 2. fig. Mißbräuche [abuses]: to extirpate, eradicate, deracinate, auch: to weed out; (zerstören, vernichten) to destroy, annihilate. II. das Ausrotten, die Ausrottung: rooting out, &c; fig. extirpation, extermination, deracination, destruction. Ausrotter: extirpator, exterminator, &c; weeder-out; destroyer. ausrotten: I. 1. (Unkraut [weeds] etc.) uproot, tear (od. pull) (s.th.) up by the roots, root (s.th.) up. 2. (Volk [a people], Rasse [race], etc.) 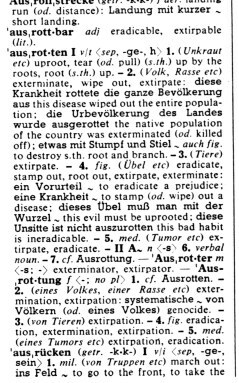 exterminate, wipe out, extirpate: diese Krankheit rottete die ganze Bevölkerung aus this disease wiped out the entire population; die Urbevölkerung des Landes wurde ausgerottet the native population of the country was exterminated (od. killed off); etwas mit Stumpf und Stiel ausrotten auch fig. to destroy s.th. root and branch. 4. (Übel [evils] etc) eradicate, stamp out, root out, extirpate, exterminate: ein Vorurteil ausrotten to eradicate a prejudice; eine Krankheit ausrotten to stamp (od. wipe) out a disease; dieses Übel muß man mit der Wurzel ausrotten this evil must be uprooted; diese Unsitte ist nich auszurotten this bad habit is ineradicable. 2. (eines Volkes [of a people], einer Rasse [of a race] etc) extermination, extirpation: systematische Ausrottung von Völkern [systematic Ausrottung of a people] (od. eines Volkes [of a people]) genocide. 3. (von Tieren [animals]) extirpation. 4. fig. eradication, extermination, extirpation. 5. med. (eines Tumors [of a tumor] etc) extirpation, eradication. All this detail confirms one simple truth. The word means killing when discussing living things, such as Unkraut (weeds), Volksstämme, Volk, Rasse (a race), Wolfe (wolves), Tiere (animals), or Tumors (tumors). Don't be confused by the second half of the 1906 dictionary definition, which quickly roughs in the noun form "Ausrottung." The smart reader will deduce the meaning from the verb form, which is given in detail for each context, and will only need the noun form to confirm the range of possible meanings. Which of those meanings to pick -- extirpation, extermination, deracination, destruction -- can be determined by the contexts given with the verb. Just because they are all listed together does not mean that a reader should cherry-pick one meaning out of context. And don't be confused by the translation "extirpate." While it is not a common English word, it has a simple meaning: "to destroy completely; to pull up by the root; to cut out by surgery; synonym: see exterminate" (Merriam-Webster). So when does "ausrotten" not mean literally killing? Only when applied to things which cannot be literally killed. When applied to Mißbräuchen (abuses) or Übel (evils), obviously there can be no actual ending of life, because ideas are not alive, except metaphorically. In these contexts, ausrotten still means complete destruction, but it is best translated with terms like "stamp out," "deracinate," or "eradicate," which are more appropriate for describing the annihilation of an idea. Holocaust-deniers will sometimes cherry-pick the most harmless-sounding translation from a figurative context, and pretend that is how Himmler was literally describing the fate of the Jews. Don't be fooled. Or they will pretend to be German etymologists and analyze each syllable of the word. While "aus" and "rotten" are cognate with English "out" and "root," the compound word has had its present meaning, and no other, since the 15th century. Saying "aus-rotten" combines to mean "up-root" makes as much sense as an American denier claiming that the Latin roots "ex" (out of) and "terminus" (borders) combine into "ex-terminate"... meaning "deportation." Huh? If you as an English reader just did a double-take, that is how a German reader would react to misreading "ausrotten" as "uprooting" human beings. It's just wrong. And lastly, none of this debate is even necessary. The German word "umbringen" simply means "kill." There are no questions about this translation. Case closed.